What really pollutes our democracy? 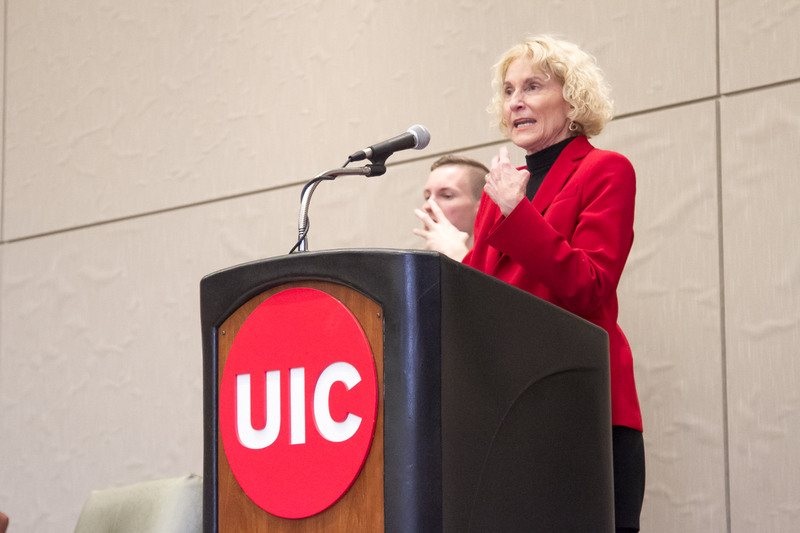 Philosopher Martha Nussbaum addressed related questions Feb. 5 at the latest UIC Campus Conversation, a series sponsored by the Office of the Provost and Vice Chancellor for Academic Affairs. During the event, Nussbaum presented a lecture before being joined on stage by Jennifer Brier, professor of gender and women’s studies and history, and Roderick Ferguson, professor of African American and gender and women’s studies. Her response looked at human emotion, focusing on one emotion felt by many in an era known for its political polarization: anger. This kind of anger, when mixed with other feelings like fear and powerlessness, fuels vengeful ideas of blame and punishment, and that thinking has a larger, more negative impact on society. Nussbaum said the belief couldn’t be further from the truth. She pointed to movements of “non-anger” that were successful, like those led by Mohandas Gandhi, Nelson Mandela and Martin Luther King Jr., for example. But there’s a different type of anger that Nussbaum said may still be valuable. Near the end of her discussion, Nussbaum proposed a solution to the anger problem: turning to emotions like love and hope instead. “We have an obligation to do good in society and to do good for others,” Nussbaum said. Graduate student in criminology Sarah Malone said Nussbaum’s lecture touched on topics that many people are thinking about.